The first thing I ask in my guided meditation practices is for you to sit in a comfortable sitting posture. Comfortable can mean all kinds of positions and in case you are wondering if you are doing it right you can learn about it here. Aligment of the back, neck and head in a comfortable upright natural way, with your chin slightly lowered. Relaxation of muscles, particularly the neck, shoulders and face. The posture should be comfortable. The arms should hang effortlessly, with the hands resting in the lap or lightly on the knees. The legs should be comfortable and relaxed and if your knees do not touch the ground you can support them with extra cushions to ease any pain in the hips. Stillness of body means stability, not easily moved, with a sense of balance. To find your centre of balance you can gently rock side to side and forward and backward until you find a sense of the middle of your posture. For the duration of the meditation it is important to sit still. In Mindfulness meditation formal practice, the postures have some basic elements that are employed around the world in order to calm the mind and align the body (that’s why when you see a picture of someone meditating they all are in the same position). These elements are: sitting, elongate the spine, resting your hands, relaxing the shoulders, tucking in the chin, opening the jaw and resting your gaze. I’ll explain each one briefly. 1. Sitting down: You can sit on a chair or on a firm pillow on the ground. If you sit on a chair be sure to sit away from the back of the chair and place your feet firmly on the Floor, aligned with your hips and knees. If you sit on the ground cross-legged it helps if you have a good firm cushion. Nowdays you can find meditation cushions everywhere at reasonable prices. Depending on your flexibility and yoga practice you can sit Quarter Lotus (cross-legged with your legs loosely croossed and your feet resting bellow the opposite thigh or knee), the Full Lotus ( legs crossed with both feet resting on top of your opposite thights), or if you cannot sit with your legs crossed, that is fine, you can sit with both feet laying on the Floor in a relaxed position (aka sukhasana or easy pose). Instead of sitting with your legs crossed you can also kneel and place a cushion or a wood bench between your legs. You can also meditate lying down, try to bend your knees with your feet on the ground in order to maintain some sense of wakefulness. 2. Elongate the spine: Sitting gives you a firm foundation and it is importante to lift yourself up through your spine. You want to feel uplifted when you meditate.Your back should be straight and aligned with neck and head. 3. Resting your hands: The most simple thing to do with your hands is to rest them on your lap. You can rest them with the palms down on your thighs. Or you can place your right hand on top of your left with the thumbs lightly touching, resting them on your lap. 4. Relaxing the shoulders: Your shoulders should be relaxed and away from your neck. You can push them slightly back. This establishes a strong back while opening up the front body. 5. Tucking in the chin: Slightly tuck in your chin,this allows your head not to be upwards and gives you rest. 6. Opening the jaw: To open the jaw gives a sense of relaxation to the face muscles. 7. Resting the gaze: You can meditate either with your eyes closed or open. With open eyes you should relax your eyes two or three feet ahead on the ground. If you take some time before practice to settle in to a comfortable posture, following these simple elements you will find it much easier to rest your mind and concentrate and you will start your practice relaxed. Personally, to achieve my posture, I use the mountain visualization. After I develop alignment and relaxation in my posture I imagine I am like a mountain to help me be deeply rooted into the earth, grounded and stable. The key here is to remain unmoved and extremely still with the magnificence of a mountain. As you can see there are many postures (or positions) you could try, most of them easy to achieve. You shouldn’t force your body to execute any posture. Fundamentally, although it does take time to get used to sitting still, mind and body should be at ease, dignified and alert. 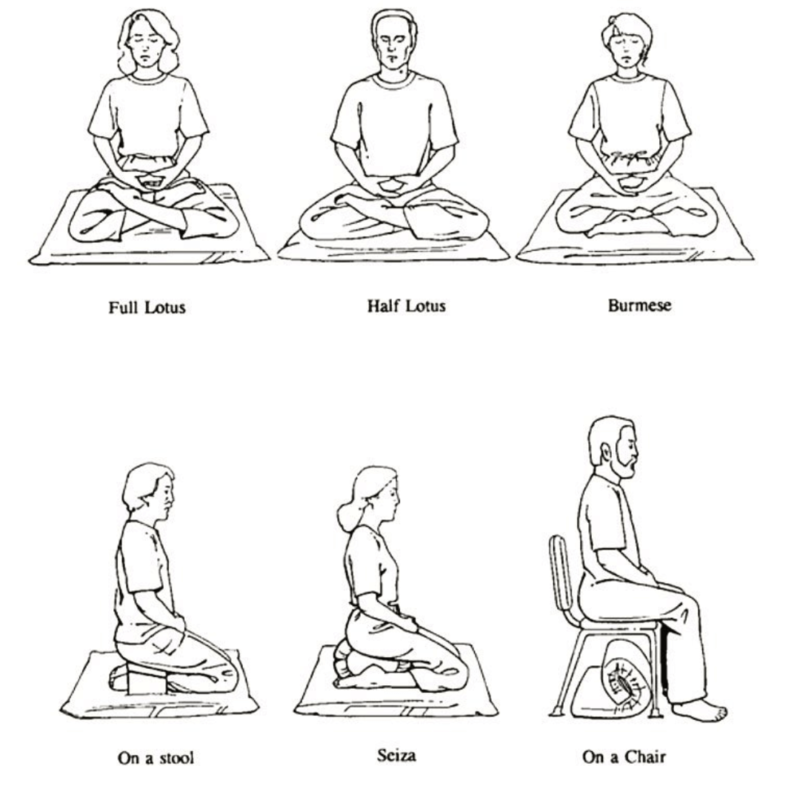 It’s important to say that these are postures used on formal practice of meditation. But you don’t have to be dependent on the right position or the right pillow or space to meditate. You can meditate on your desk at work between appointments, on the train, on the bench in the park, home when the kids are busy with homework. Choose and practice what works for you. There is no right or wrong when it comes to meditation practice. Meditation is not about the right posture , it is a state of mind, the state of awareness. No matter what, you will struggle with focusing and staying present. We all do. Know that and be kind to yourself!